The knowledge to plan and execute single and repetitive decompression dives using a single stage cylinder of enriched air or oxygen to accelerate or add conservatism to the decompression stops. 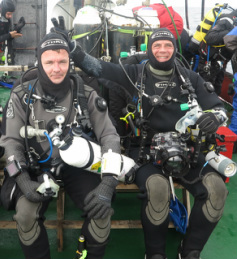 You'll use basic Tec diving equipment including a stage cylinder. Stage cylinders can be supplied free of charge for the duration of the course. The pack includes a manual, dive planning checklist and dive planning slate. The optional Equipment Set-up and Key Skills video on DVD is a great tool to help you practice at home in between your Tec diving adventures. You'll continue to use the Tec Deep Diver Crew-Pak through to Tec 50. - 12 dives were made with enriched air nitrox deeper than 18 metres / 60 feet. Having completed the Tec 45 course move onwards and upwards solidifying your skills further with the PADI Tec 50 course! Normally held at an inland dive site around Bristol completing four dives in open water over two days. Click on the photo for information on our Beginners Courses! Click on the photo for information on our Continued Education Courses! Click on the photo for more information on our Technical Courses! Click on the photo for information on our Professional Level Courses!